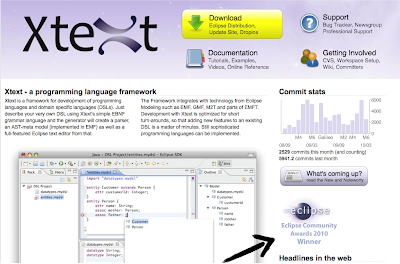 sven efftinge's blog: Xtext won Eclipse Community Award! Xtext won Eclipse Community Award! What a great community you are! Thank you so much for giving us this kind of support. We are all incredibly proud about the fact that Xtext has won the Eclipse Community Award 2010. I also want to take the opportunity to say thank you to the team once more. Especially to Dennis Huebner who couldn't make it to this year's EclipseCon. Itemis and in particular our bosses Wolfgang Neuhaus and Jens Wagener also deserve a big thank you: If they hadn't believed in my vision two years ago and still do, there were no Xtext and we were all working on different things and hadn't had the chance to combine our forces to create our favorite programming language and IDE development framework. I already put the award logo Lynn sent me on our website. See how nice it fits into the Xtext-Nova theme. 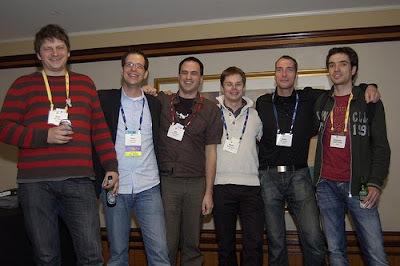 EclipseCon 2010 was so much fun. I'm still in San Francisco but am already looking forward to next year's issue of my favorite conference. Thank you for all the support!